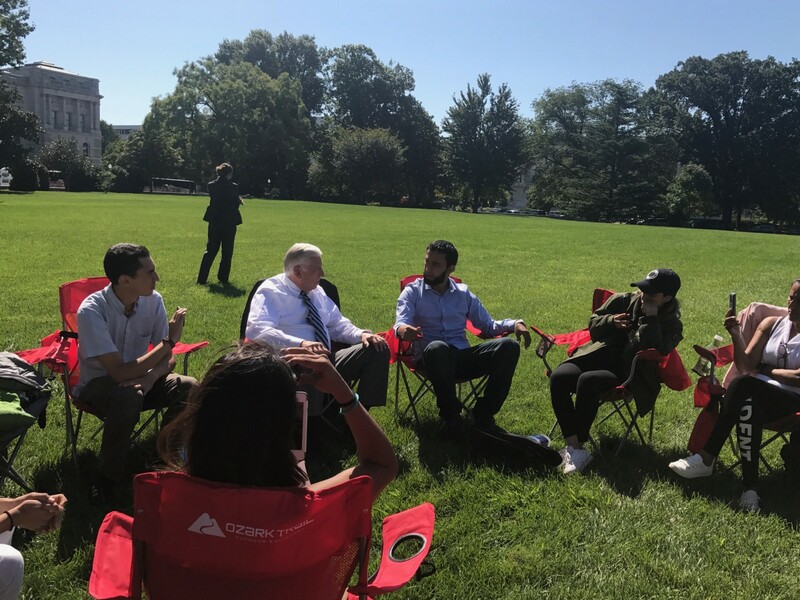 Whip Hoyer speaks with DREAMers fasting outside the Capitol. To my fellow Americans in mind and in spirit, to the DREAMers who yearn to be accepted in full by the nation they love and call home — I write to reassure you that you do not stand alone in this time of challenge. I, along with Democrats in Congress and an overwhelming majority of the American people, understand your fears and support your aspirations. We are determined to do the right thing and give you the chance you have earned to stay in this country and help build its future. Since President Trump announced his cruel and misguided decision to end the Deferred Action for Childhood Arrivals (DACA) program, many of you have been living beneath a cloud of anxiety and uncertainty. DACA provided a lifeline that allowed you to study, work, obtain a driver’s license, and take other steps that made it possible for you to come out from the shadows. The federal government asked you to register, and you put your trust in it, coming forward and into the public eye. In return, you were promised security and opportunity — nothing less than the chance to reach for the same American Dream for which all our people strive. Now, however, the Trump Administration has taken that assurance away. But our republic was founded by immigrants, refugees, and their descendants as a nation that adheres to the ancient principle that we do not punish children for the actions of their parents. That is why Congress should ensure that you can stay here in the country you call home and that will be enriched by your presence. You may not have been born in the United States. You may not have arrived here with documents that confer upon you the status of legal residents. But having talked to so many of you, one cannot doubt your love for this country and your place in it. 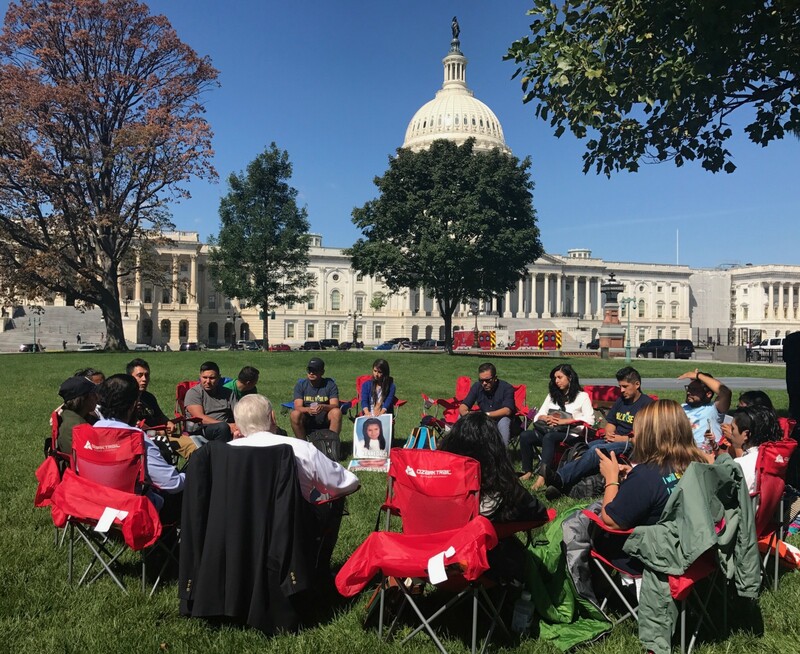 I recently met with DREAMers who were fasting outside of the Capitol building. They were courageously drawing attention to how DACA has enabled them to live normal lives and contribute more fully to their communities. They told me that they don’t want to return to being afraid and living in the shadows. They want to stay in school and continue their careers as lawyers, doctors, nurses, innovators, teachers, manufacturers, and those in every skilled trade. They want to continue supporting their families, building their lives here, and serving their country and communities. You deserve every opportunity to stay here and succeed. You deserve a permanent solution that will allow you to remain in this country. You deserve to be seen, not hidden away in dark corners. We see Luis, who grew up with the dream of serving his country in uniform. When he was denied the opportunity to serve in the military because of his status, DACA enabled him to pursue a nursing career, and he’s now taking care of Hurricane Harvey victims in Texas. Luis told me he was born to be a nurse. At a time when we have a nursing shortage, we shouldn’t be sending him away. We see Fernanda, who was raised in Alabama and graduated with honors from a four-year university, thanks to a scholarship she received once she had registered under DACA. We see Diego, who graduated from the University of Arkansas and worked as a Public Policy Fellow with the Congressional Hispanic Caucus Institute, helping to advocate on behalf of other DREAMers like him. And we see you. We see the productive life you are living as part of a community in the United States. We see your strength and your determination. We see you have played by the rules. We see your patriotism and your pride in calling yourself an American. And we will continue to stand with you and never stop working until Congress passes the DREAM Act that will allow you to remain here. You are not alone. You are not invisible. Your dream is the American Dream. We dream it together. And we will not stop fighting until you have assurances you’ll be able to pursue it.